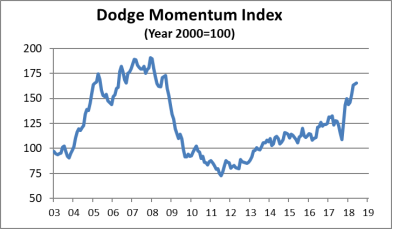 The Dodge Momentum Index grew 0.8 percent in June to 165.5 (2000=100) from the revised May reading of 164.2. The Momentum Index is a monthly measure of the first (or initial) report for nonresidential building projects in planning, which have been shown to lead construction spending for nonresidential buildings by a full year. In June, the commercial component of the Momentum Index moved 1.1 percent higher, while the institutional component eked out a 0.3 percent gain. June’s advance marks the fifth straight monthly increase for the Momentum Index, which is now nearing a ten-year high, and suggests that the moderate strengthening of construction activity currently underway will continue through the end of 2018. At the same time, the gains for the Momentum Index during the most recent two months have been considerably smaller than what took place from last October through April, returning to a pace more consistent with the gradual expansion that’s been present since the recovery began back in 2011. In June, 13 projects each with a value of $100 million or more entered planning. The two leading commercial projects were a $300 million hotel in Orlando, Fla., and a $225 million warehouse in Rialto, Calif. The leading institutional projects were the $349 million outpatient medical facility in Richmond VA and a $200 million hospital in Venice, Fla.
Click here for more from Dodge Data & Analytics.